Paro is a mystic serene hilly town which is rather limited in its gastronomic offerings. Do not go to Paro seeking five star quality food and ambience or your ethnic cuisine as you will be disappointed. 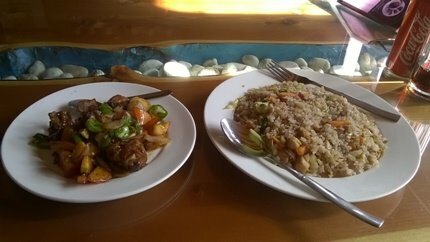 Bhutanese cuisine is not Chinese cuisine and most tourists (especially Indian ones) keep demanding Chinese food at local Bhutanese restaurants and keep getting disappointed again & again. However native Bhutanese cuisine is extremely delicious especially if you like chilies and meat and foodies will have a marvelous experience if they are willing to experiment and venture out of their comfort zone. 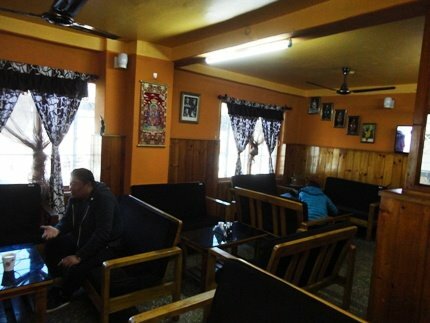 Most restaurants, cafes, bars in Paro are centred around Paro main market and they offer a mix of Bhutanese, Continental, Italian, Indian and Chinese cuisine. Most Café’s in Paro will serve a meal for two for about 1000 NU (one NU is same as one INR). Most restaurants serve alcohol and there are very few nightclubs here. 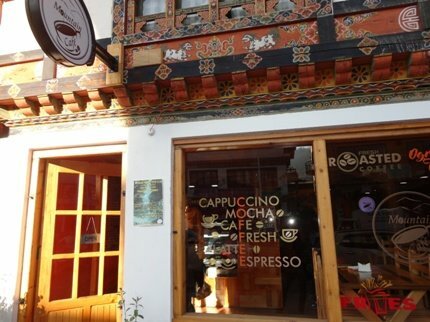 There are some good café’s and a couple of pizza places in Paro which serve to provide a distraction from the usual Bhutanese fare served in most of the restaurants. A good way to absorb the atmospheric beauty of Paro is to sit in any of these café’s and people watch while sipping on your favorite brew. These places serve continental fare along with snacks and savouries. This café is perched prettily on the Paro River Banks right beside the Bhutan Telecom Office. Unlike its more expensive counterparts…you can get delicious baked goodies and a wide variety of beverages here at a more affordable cost. A must have here is the Carrot Cake though the Chocolate Cookies were also equally delicious. 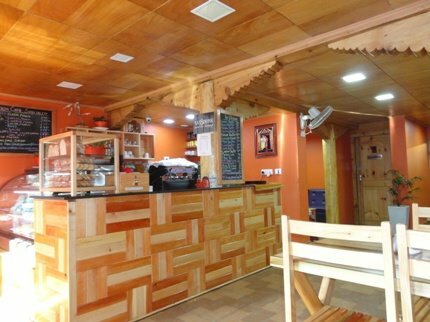 Started by 2 ex DU students, this café offers a peaceful and homely atmosphere. This is one of Paro’s most popular café’s and is run by a local Bhutanese lady for the last 5 years. Though the outdoor sitting arrangement looks sparse…inside there is a cozy, largish seating area!! The menu caters to the global audience and the costs are on the higher side. One piece of Black Forest Pastry was 150 Rs while the Cheesecake per slice was 180 Rs and both were perfect with a light, fluffy and creamy consistency. The tempting spread made me want to try everything!!! 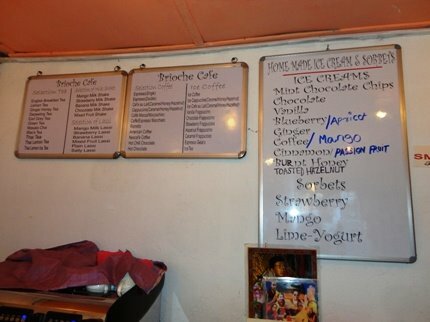 I have a good mind to try out the homemade burnt honey and passion fruit ice-cream that was on offer. However, on the flip side there is not much place to sit apart from a couple of chairs outside. The Mountain Café is just a few steps away from Brioche Café and offers a warmer and better ambience. 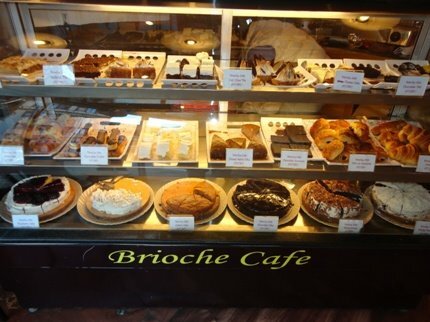 They have a large selection of coffees and organic teas along with milkshakes and pastries. However what charmed a few Indian tourists walking in were the loved words “Garlic Naan” written on the menu board. They do serve a selection of Indian Flatbreads with Curries at an exorbitant rate (Garlic Naan is 240 NU). However you have to remember that Paro is basically oriented towards western tourists. What I liked about the place was the warm comfortable ambience (there was a room heater) and their new offerings Kahlua Coffee with Cream and Hot Rum Coffee with Cream, both reasonably priced at 250 NUS. Address: Tshongdue, Paro 12001, Bhutan (few yards from Brioche Cafe). 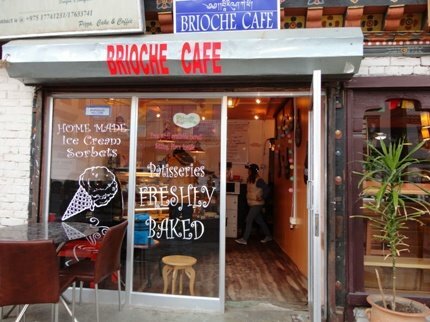 This place is close to the Paro Vegetable market and next to Café Brioche and is a good option to avail if you are tired of sampling Bhutanese cuisine. The Exotic veggie pizza and the Seafood Pizza are the best draws and a meal for two will only cost you about 650 to 700 NU. There are many restaurants in Paro…in fact half of the shops you see in town will either be a café or restaurant. 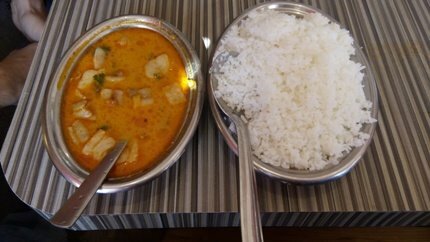 However, cuisine diversity is low especially in budget restaurants as you will mostly get either Bhutanese or Indian or Continental cuisine. Also, most places do not accept cards so make sure you carry plenty of cash. There is a wide gap between budget & upscale restaurants in Paro. Most of them do not charge the 20% tax (10% Bhutan tax and 10% service tax) as charged by the upscale restaurants. These restaurants do not accept cards. You can expect a decent meal for two for 600 NU to 800 NU. 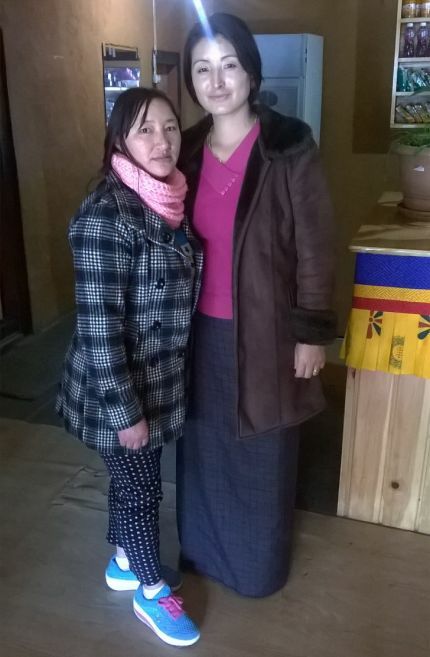 Run by the charming Tshering Yuden for the last 8 years, Taste of Bhutan is a homely little Bhutanese restaurant situated in Paro main market offering a wide selection of Bhutanese cuisine and a limited array of Continental, Chinese and Indian food. The ambience is homely and colorful with Bamboo furniture and traditional Bhutani décor. 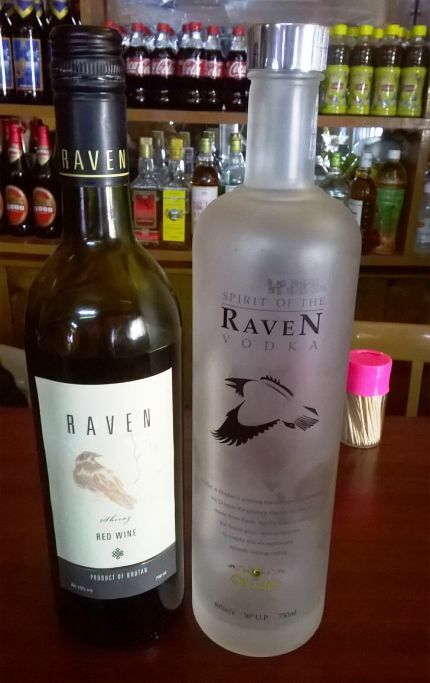 Like all Bhutanese restaurants this place has a bar and I spotted the famous local Raven Vodka and the Raven Red Wine here. 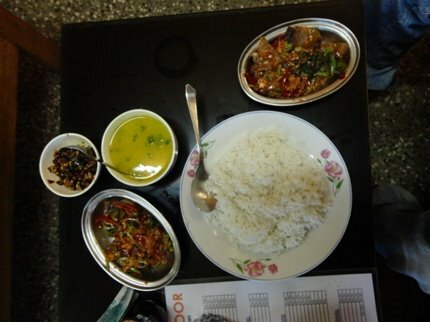 Bhutanese cuisine here has some indigenous options like Phaksha Paa, norsha paa, beef datshi, asparagus Datshi etc. 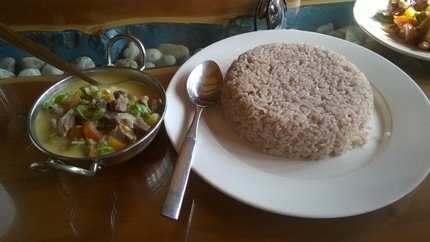 I chose to have the beef datshi along with red rice (Bhutanese red rice is high fiber and has a delicious nutty flavor). My friend chose Chilly Chicken and Fried rice and that too came cooked in red rice combined with local vegetables. It was delicious but a spin on regular Chinese food…if you know what I mean. The beef datshi was however a gastronomic delight and I revelled in the marriage of two of my favorites…. beef and cheese. I polished off every spoon of this exotic Bhutanese dish tempered with chilies (I had requested for a toned-down version), potato cubes and spinach and was still craving for more. The rice (as you can see below) is too much for one person though it had a nice nutty flavour. Vegetarians can go for Emma Datshi (Bhutan’s national dish) or Asparagus Datshi (cheese cooked with chilies and Asparagus). The Bhutanese girls running the place had some communication problems with us and it's recommended to write down preferred menu items on paper so that language barriers are resolved. Funnily, the owner didn’t know her shop’s phone number and smilingly told us that the best way to locate 'Taste of Bhutan' is "ask anybody”. Location: Paro Main Market. The unusual looking name and the strong recommendations of our taxi driver were what first drew me to this restaurant. Perched up on the first floor of The Bhutan curio shop, this is easy to miss. The owner is a remarkably good looking young man Prem who also happens to be the head chef. It was all warm and cozy inside because of two heaters…. The menu has Indian, Bhutanese dishes and a different take on Continental Food ? I ordered Shikham Pha with rice, daal and pickle. On offer were other Bhutanese dishes like Sukham Pha (Beef), Emma Datsi, Beef Datsi etc. Shikham Pha is an amazingly delicious dry pork preparation with red chilies, onion, coriander, ginger and some local saag. It tastes just as delicious as it looked and the chilies are perfect for beating the nip in the air. I had my meal with peach flavored iced tea and was satisfied with the experience. Indian specials in the menu includes chicken curry, fish curry, egg curry, pork curry, alu dum, mottor paneer, paratha etc. The menu also includes snack items like fish finger, pakodas, French fries etc. A meal for two would only cost you around NU 500 on First Floor and if you are looking for an authentic Bhutanese Culinary experience in an economical way then do visit. 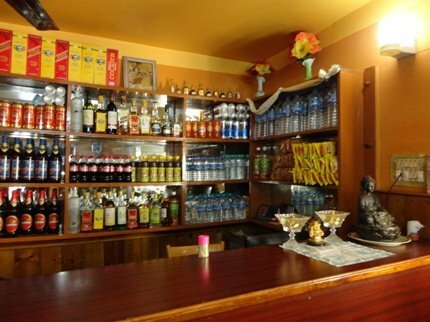 This restaurant is easy to spot as it is located opposite the festival ground and Tshongdue Lhakhang in Paro. With an interesting array of Chinese, Continental, American, Tibetan and Bhutanese items…this is really a versatile restaurant. 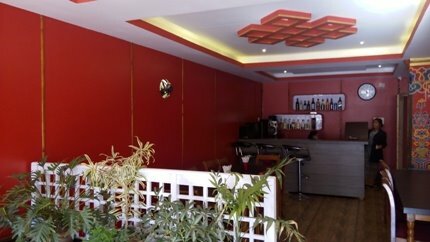 The interiors are cozy and there is a red sofa that is particularly ideal to have long gossip sessions. 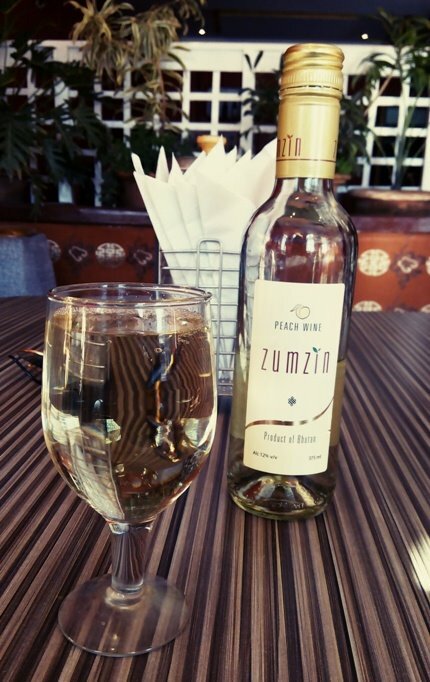 Like most restaurants in Bhutan, Pejorling serves alcohol and I tasted a nice variant of fruity peach wine…ZumZin (a bottle costs 200 NU). My Bhutanese food spree continued with Phaksha Maroo, White Rice, Chicken Momos. The Phaksha Maroo is essentially a pork stew made with chilies, thinly sliced veggies and cheese. The combination was good and the lady at the counter told me that this is a part of Bhutanese staple diet. The portions served was good and the restaurant is reasonably priced. The menu also includes Tibetan food like momos, Thukpa etc, Continental dishes, stews, burgers, few Chinese dishes as well as snack items including India snacks like pakodas. Sonam Trophel is the place to go if you are craving for some authentic Indian food and have gastronomical homesickness. Serves great naan, tandoori roti, chicken curry, vegetable korma etc apart from Chinese and Bhutanese fare. Very affordable and well maintained place …. this is the go-to place for most tourists. If you are an Indian and have been dying for some home style food, then look no further than the Sonam Trophel. I am a Bengali and can vouch for the fact that the fish cooked in Mustard oil with potatoes and coriander was totally an authentic Bengali dish. A meal for two at the Sonam Trophel will cost you around 700 NUS. Note: This place is packed during season time and it will be difficult for you to get a table unless you book in advance. There are limited options for upscale/ fine dining in Paro… basically you need to visit any of the five star hotels in Paro like the Le-Meridian or UMA Paro and dine in their restaurants. These restaurants accept cards and charge 20% tax. If you are in the mood for luxury dining, then head off to Bhukhari at Uma Paro…arguably one of the finest places to dine in Bhutan. Fresh, locally sourced food and a menu which changes every three days makes Bhukari a unique experience. The cuisine is structured in a way that toxins are flushed out and the body is revitalized with energy. Shambhala cuisine as it is called only uses locally sourced food and zero chemicals to make food that re-energises the soul. The meals are all seasonally driven so the menu changes per the weather and fluctuations in produce. Bhukari is designed to make you appreciate its charms the moment you step inside its compound. The drive to the restaurant offers excellent views and as you sit inside waiting for your order, you can gaze around at the lovely snow-capped mountains of Paro. The restaurant is circular ad offers you a 360-degree view of the valley. Continental and Bhutanese food with a twist are the specialities of Bukhari so do not miss out on the Flat bread with tamarind sauce, honey sprinkled pear salad with gorgonzola cheese and walnuts, cumin flavoured pork chops, chickpea Hummus and passion fruit poach. Also, the daily Cocktail special changes every day and is a treat for the senses. Bukhari is easily the finest and the most luxurious restaurant in Paro and a meal for two would cost you around 4000 NUS with taxes. Note: Book your table two days in advance as there is a heavy rush in season (especially if you are not staying at UMA Paro). Open all seven days a week from 6.00 a.m. to 11 p.m.
About 5 km from the heart of the city lies Paro’s biggest hospitality school. As already mentioned, Bhutan earns a major chunk of its revenue from tourism and takes pride in cultivating high standards in hospitality. Well Tou Zaiga is the restaurant run by Bhutan’s finest hospitality School and represents the talents of Bhutan’s upcoming chefs who are being groomed in that very school. This itself should make this place a must visit (especially if you are flying in or out of Paro) but the DrukAir flight landings that can be seen from their outdoor seating area is the icing on the cake. If it’s not raining…do sit outside and watch the beautiful Paro Valley spreading itself out. The service is reminiscent of a Michelam starred restaurant in Europe…it’s so old world and courteous. The food menu changes every day so it’s a set 3 course meal every day with soup/ salad, main course and desert. Unlike most other restaurants in Bhutan you will get authentic and tasteful prepared vegetarian dishes too like spinach ravioli, pies or cottage cheese curry. A must visit for the ambience and a chance to interact with the upcoming culinary experts of Bhutan. Paro doesn’t really have a happening nightlife, but then again who comes to Bhutan seeking flashy western style nightlife. What you have basically are quiet taverns, small pubs and homely bars. Every restaurant has its own bar (almost) but very few of them remain open post 9 p.m. If you are interested in pub hopping or checking out the bar scene at Paro…you could check out these spots. Remember. Tuesdays are dry days in Bhutan. If you are taking a flight to Bhutan, then you would be landing at Paro Airport which is ten minutes away from COMO Paro Bar. Uma Paro is owned by COMO Group is one of the finest hotels in Bhutan. Their bar “UMA Bar” has a great collection of international liquor brands and is the best place to enjoy a luxurious evening cocktail or a relaxed glass of wine. On offer are a healthy selection of COMO Shambhala snacks that are meant to detoxify the body. Check out the Bailey’s, Kahlua, Tequila shots on offer. Walk down to the basement of Sonam trophel restaurant to discover club K. Interestingly the owner doubles as the main bouncer in the club and the crowd is relatively good. Every Wednesday, its free entrance for ladies along with one drink on the house. The entry fee ranges between 200 BTN to 300 NU (off season-peak season). Club K is touted to be the best night-spot in Paro. Open from 9 p.m. onwards though the party starts after 11.30 p.m. If interaction with the locals is a part of your agenda, then the Millennium Club will appeal to you. Great ambience, very affordable flow of drinks and an entry fee of only 200 NU makes this a good place to hang out on Saturday night. The interesting fact is that the Millennium Club is only open on Wednesday, Friday and Saturdays which is why people look forward to these days the whole week.